From the files of The Gazette October 16, 1997. 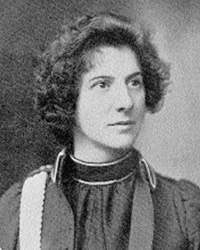 Evangeline Cory Booth was born in a suburb of London, England, on Dec. 25, 1865. She was the youngest of seven children, and the fourth girl, born to Catherine Mumford and William Booth. Her father, an ordained Methodist clergyman, was involved in missionary work in the east end of London in the 1860s and founded the organization which in 1878 became officially known as the Salvation Army. Courtesy of Archives and Special Collections, Memorial University of Newfoundland, St. John's, NL. Evangeline Booth was involved with her father's work from an early age. Educated at home, she was preaching on street corners while still in her teens. She was given command of the Marylebone Corps at the age of 20 and at 23 was made Field Commander for England. In 1891 she was re-assigned to the training college in London, preparing new recruits for the work ahead of them as officers in the Salvation Army. Five years later Evangeline Booth was made field commissioner (territorial commander) of the Salvation Army in Canada, which included responsibility for Newfoundland. She criss-crossed Canada many times, delivering the army's message to often hostile crowds. She went as far north as the Yukon during the Klondike gold rush in 1898. In 1904 she was transferred to the United States as commander, a position she was to hold for 30 years. She is credited with putting the army on a firm footing, both spiritually and financially, in the United States, converting thousands of people and raising millions of dollars. Evangeline Booth visited Newfoundland on two occasions during her years as field commissioner for Canada: November 1896 and February 1899. Each time she brought her message of salvation to large and enthusiastic crowds of Newfoundlanders, many of whom were converted during her services. The Daily News reported on one such service held at the British Hall, St. John's, on Feb. 13, 1899. The hall was filled to capacity and hundreds were turned away at the door, as there was no room to let more in. Those in attendance listened in "rapt attention as the story of love and sympathy and work for God and man was told." In 1934 Evangeline Booth became the fourth person to be elected general and world leader of the Salvation Army; the first two were her father and her brother Bramwell Booth. She served in that capacity until 1939, when she officially retired. Retirement did not stop her from being one of the great assets of the Salvation Army, however, as she continued to spread the message wherever she went. An orator and preacher with a tremendous power of delivery, she was in much demand as a speaker throughout the United States. Many of her addresses were published in the book Toward a Better World. Evangeline Booth died, or to use the Salvation Army term, was promoted to glory, on July 17, 1950. The archives has a single item related to the life and work of Evangeline Booth. It is a three-page form letter, typed, on Salvation Army letterhead, dated November 1897, and signed by her in her capacity as field commissioner. This letter is important as it demonstrates Booth's and the Salvation Army's approach to raising money for charitable works in the 1890s. The recipient, James Porter of Elliston, Newfoundland, also felt it was important enough to keep, even though it is addressed simply "My dear Comrade." "Soldier Jim," as Porter was known, was the first person to enrol as a soldier in the Salvation Army's Elliston Corps. For many years the letter was preserved inside a picture frame containing a religious picture belonging to the Porter family.